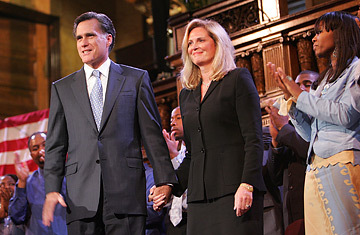 Former Massachusetts Governor Mitt Romney and his wife Ann at the Tremont Temple Baptist Church, Boston, Mass. Richard Land, the head of the gigantic (16.3 million-member) Southern Baptist Convention's Ethics & Religious Liberty Commission and its most influential political operative, has dived headlong into what has become a favorite Baptist parlor game: What exactly is a Mormon? It's a question that has special significance right now, since it relates to how religious conservatives regard the Mormon candidate Mitt Romney. On Wednesday, the EthicsDaily.com newswire, which is written by and for Baptists with views more liberal than the SBC's, reported that Land, expanding on remarks he made last week at a gathering of political conservatives, told Al Hunt on his Bloomberg TV show Political Capital that he considers the Church of Jesus Christ of Latter-day Saints, as the Mormons know themselves, as "being the fourth Abrahamic Religion," in addition to Judaism, Christianity and Islam, all of which trace roots of race or belief back to the patriarch Abraham. The Mormons regard themselves as Christians, and Jesus figures prominently on the covers of LDS publications. They believe that after the death of Christ's apostles his church became confused, a period that ended only with the restoration of the Gospel by the presentation of another book of scripture by an angel to LDS founder Joseph Smith. Most Christian theologians, however, disagree, not just because they disbelieve the angel story and the Book of Mormon that resulted, but by pointing to Mormon concepts including the ability of humans to become godlike entities after death. Most perturbed have been conservative Evangelicals like the Southern Baptists, who share many of the Mormons' conservatiave social values yet have a very strict view of what is and what is not scripture, and find themselves in competition with the LDS for congregants. Yet the question of what exactly Mormons are, if they aren't Christian, has taken on increasing urgency as Romney has gained support among values voters (coming in first, for instance, in a straw poll taken by the Family Research Council last Saturday, narrowly edging out Arkansas Govenor Mike Huckabee, a former Baptist pastor). Neither the theological nor the political issue is settled in the Baptist heart. EthicsDaily.com reports that the pastor of the largest Baptist church in Spartanburg, S.C., first endorsed Romney and recently retracted the endorsement, calling it a "personal mistake," while a prominent colleague in Texas is quoted as saying, "Even though he talks about Jesus as his Lord and Savior, he is not a Christian... Mormonism is a cult." EthicsDaily.com implies that the Texan's position may be out of date, since SBC documents that had previously listed the faith under a "cults and sects" section have moved it to a "newly developed religions" page. But Land's comment seems to go a step further. A cult, he said on the Bloomberg show, "is a form of faith which does not comply with the essential teachings of the Christian faith but claims to be within the Christian faith or to be the true expression of the Christian faith, as opposed to being another religion like Judaism." Land explained that he would look at Mormonism "as another faith in the same sense that I would look upon Islam as another faith. I think the fairest and most charitable way to define Mormonism would be to call it the fourth Abrahamic religion  Judaism being the first, Christianity being the second, Islam being the third, and Mormonism being the fourth. And Joseph Smith would play the same character in Mormonism that Muhammad plays in Islam." This raises all sorts of interesting questions. One, is it a promotion or a demotion? "Abrahamic religion" sounds a lot grander than "cult." However, Land also seems to suggest that Mormonism is no more Christian than is Islam. The second is whether it makes it any easier for a Southern Baptist concerned with theological niceties to vote for Romney. A third is whether Land, an extremely well educated and articulate man, is crediting Mormonism with being monotheistic, which is arguably what Abraham was all about. Many evangelicals contend that the LDS are polytheists, believing in plural Gods. Mormons respond that their tenets are no more polytheistic than the Christian belief in the Trinity. What explains Land's venture into religious taxonomy? Perhaps the fact that as the Wall Street Journal noted last April, he is "a man waiting to be courted, [who] on behalf of religious conservatives is playing hard to get." Land has repeatedly hinted that he might be able to vote for Romney, who reportedly came to him and asked for advice on how to handle the religion issue; Land told him, in effect, that he needed to de-fang the issue much as John Fitzgerald Kennedy did with his famous 1960 speech to the Greater Houston Ministerial Association. As the columnist E.J. Dionne points out, however, JFK's speech clearly separated his Catholicism from his politics. It will be much more difficult for any G.O.P. candidate to relegate his religion to the sidelines in the same way. Until Romney can pull off that trick, Land must walk his own tightrope between his theologically conservative Convention and his pragmatic desire to see an electable socially conservative Republican presidential candidate. The Abrahamic remark can be understood as an impressive act of political equipoise: being less snarky about Romney's status without letting him totally off the hook. At some future point in time, perhaps Land will come back and work out the theological niceties.